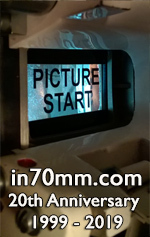 The Norwegian film institute proudly presents the 10th Oslo 70mm festival. The program is a mix of vintage original prints, blow-ups and restored classics. This festival, dedicated to a movie format over 50 years old, is a dream for a lot of movie fans around the world. Today, movies and cinemas have reached a time of change – a change from film based to digital cinema and a change in the way movies are felt and understood. 2100 70mm: EARTHQUAKE in SENSURROUND!